Homesteading comes with many trials and having a herd of goats in one of them. Know the challenges you will face will help you in your homesteading endeavors. 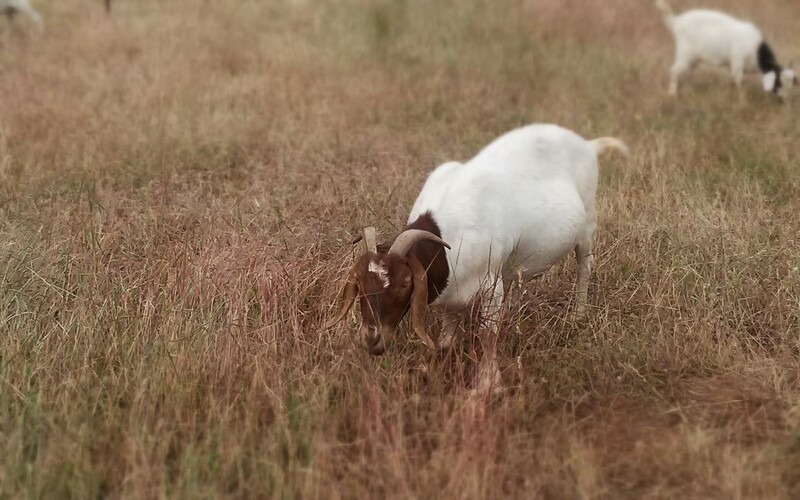 Along with a variety of other animals, we raise meat goats for market on our farm in the Sierra Nevada Mountains. Our herd consists of Boers and Kikos (plus a couple of dairy goat mutts for our own milk consumption) and we breed towards production, not show. As such, all of our goats are expected to be hardy, easy-keepers that require little intervention and are able to produce a good feed-to-meat ratio on mostly forage. Adult goats are expected to mostly forgo the pampering that some people’s herds are blessed with, like warm barns and cozy nests of hay, even though our area averages below freezing temperatures in winter and it’s not uncommon to get several feet of snow after a storm. The only exception to this rule is during kidding season when does and kids need additional shelter or we have an animal that requires veterinary care or convalescing. We do have a 3-sided shelter for the goats to come in out of wind and rain, but for the most part, they choose to be out and about unless it’s really pouring. Stella, a five-year-old Boer doe, came to us about a year ago from a local woman who homesteads. She had dwarf Nigerians and small children; and Stella, in all her big, brassy Boer glory, was running them all ragged. The woman’s property had a perimeter fence and a smaller fenced area for the goats, but for the most part, she allowed all the goats to run around freely in her yard and driveway area. This meant neither species of “kid” was able to get away from Stella and her horns. So, despite the fact that she was an easy keeper, proven kidder, and great mother Stella had to go. She proved to be just as much a handful once we got her to our farm as she had been at the homestead that she came from. She had no concept of what a stanchion was about, didn’t want anyone touching her feet, and acted like her life depended on getting away every time we put a lead on her. It was obvious Stella was going to need some hands-on work to make it safe for us to work with her. The first order of business was to take the dog collar off of her. We don’t keep any kind of rope, collar, or halter on our goats. As pastured goats with horns, it’s too easy for them to get them caught on branches or each other. Stella didn’t like us much and if she had been trained to come to a feed bucket, she didn’t act like it. She was not about to be fooled by our shenanigans. So how do you catch an ornery, unfriendly goat that can out-run and out-mountain climb you? With a lariat, of course! We roped Stella from the ground and quickly tied her to a sturdy picket line. For those of you that don’t know, a picket line is usually a rope tied high between two trees or similar sturdy posts and the lead line (or lariat rope, in this case) is then tied to it. This keeps the lead off the ground where there’s less chance the animal will get entangled in it and injure themselves. We stood close by while Stella fought the rope just in case she needed rescuing. Once she calmed down, we rewarded her calm behavior with a few treats and then released her from the rope. This conditioning was repeated a few times a day until Stella stopped fighting the rope and allowed us to approach her calmly to slip the lead over her horns and head. Once she could be tied safely without hurting herself or us, we started teaching her to let us handle her feet and run our hands all over her body. This is an important step, even for free-range goats. A goat that can’t be handled during calm times can’t be helped during kidding and becomes an increased danger to everyone during stressful times like hoof trimming and veterinary care. Eventually, Stella was taught to climb onto the stanchion and to behave for routine physical exams and hoof-trimmings. I like to think that Stella even learned to like us. She no longer runs at the sight of us and will instead come running when she hears our pick-up truck coming down the dirt road to the pasture gate. She stands calmly, lead or no, to get her back scratched. If I call her name, even if she’s acres away but still within hearing range, I can hear her calling back to me in acknowledgement. When she was eventually allowed out to pasture with the rest of the herd, she was no kinder to them than she had been with us initially. We had to spend more time than usual introducing Stella to the herd while they all worked out the new pecking order. Despite how encouraging her attitude improvement had been with us after her daily ground work, we had serious concerns about whether or not Stella would be able to safely integrate with the rest of the goats. Stella’s education wasn’t over- it was time to show her what a Shepherd’s staff was all about. We have a couple of staffs in the barn that we use when it’s time to work the herd, but most of the time we use just use whatever suitable hardwood branch we find laying around close by in the forest. Staffs should not be used to hit any animal. They’re used as an extension of your hand to push or prod animals along or as a device placed between two warring goats to keep them apart. Occasionally, we’ll tie something flappy like a rag or a plastic bag to one end. The extra movement and noise can distract a goat long enough to break up a fight or, if swished behind them, will hurry them along when trying to herd them. After about a week or so, the goats had worked out their pecking order and there was no doubt in anyone’s mind who was the new matriarch of the herd – Stella was in charge. She has become a wonderful herd queen. She’s gentle with the kids (even those that don’t belong to her), keeps a watchful eye out for predators, and sounds the alarm to run to the shelter if she sees anything out of the ordinary. She has become so good at leading the herd and keeping everyone behaving that we can put a lead on Stella and the rest of the herd will follow as politely and orderly as a goat ever gets. We’ve acquired other adult goats since we brought Stella to the farm and with each new goat addition, the herd dynamic changes within the ranks. The lesser goats will vie for a position in the pecking order, but Stella, ever vigilant to discord in her herd, quickly put an end to goat-on-goat violence without really ever needing to get too physical herself. I’m not sure how she does it, but I’m thinking she must have a “mom look” that tells a goat to behave that isn’t perceptible to humans. We’ve grown very fond of Stella and now consider her an asset to our herd. She is, by all measures, exactly what one hopes for in a herd queen in pasture-raised goats. Our pasture is fairly flat by local standards, but this is the Sierras, so the goats have to climb up and down the mountain to forage. The shelter is located at the top of the hill close to the big barn and is closely surrounded by a welded wire fence. Each night, just before sundown, we call the goats in so we can lock them into this smaller enclosure and protect them from predators like coyotes, bobcats, mountain lions, and bear. Stella is always in the lead, calling to us that she’s coming even before we can see her and calling to the other goats that it’s time to come in. It was during one of those evenings a few weeks ago that we noticed something was not right with Stella, our herd queen. Nice read….and nice to be in the country.